p until this week, I have never explored the genealogical resources for the State of Maine. By using the Places tab on Family Tree Maker, I was able to quickly pinpoint my ancestors who lived in Maine (Brown, Rice and Spaulding). Today I will address my findings for the Spaulding family. On the Maine Memory Network website under “Maine History Online,” I discovered a reference to Helen F. Spaulding (http://www.mainememory.net/sitebuilder/site/779/slideshow/422/display?use_mmn=1&prev_object_id=1188&prev_object=page). I learned that Helen was born in Chelmsford, Massachusetts (a town whose graveyards are filled with my Spaulding ancestors) and that she was the only female student from out of state at Westbrook Seminary’s Class of 1864. Helen’s photograph was included, and copies can be ordered. (1) For information on Westbrook see http://en.wikipedia.org/wiki/Westbrook_College. At the Maine State Archives “Civil War Officers and Other Misc. Photographs” (http://www.maine.gov/sos/arc/archives/military/civilwar/offpix.htm), I found a reference to Capt. Joseph Spaulding in Co. A of the 19th Regiment, Maine Volunteer Infantry, along with a negative number. Copies of photographs can be provided for a nominal fee. (2) Also on the Maine State Archives site, I found a list of Spauldings (Eleazer, Samuel and Samuel) who were granted Revolutionary War land grants (http://www.maine.gov/sos/arc/research/revwargrants3.html). (3) In addition, the Maine State Archives website has a searchable Death Index (1-1-1960 to 12-31-2009) and Marriage Index (1-1-1892 to 12-31-2009). On the USGenWeb Maine website (http://files.usgwarchives.net/me/androscoggin/sabattus/families/spfiles.txt), I found a great detail of information on the Spauldings. Joseph Spaulding, one of my distant cousins, was born in 1760 in New Hampshire and married Mary Collins in 1787 in Maine. They belonged to the Society of Friends, and he served in the War of 1812. Their children and their children’s spouses are listed. (4) Now I have new avenues of research—military and religious records no doubt exist. Another wonderful site is Maine Genealogy (http://www.mainegenealogy.net). Here, you can do a quick search for an ancestor’s name and get a list of several databases where they appear. I did a search for Joseph Spaulding and got 156 results from several databases including marriages, divorces, legislative index, Maine book search, Maine court records, Maine genealogy archives, Secretary of State correspondence and Mexican War soldiers (http://www.mainegenealogy.net/global_search_results.asp?firstname=joseph&lastname=spaulding&spelling=starts). Under Maine Genealogy Archives, I found Joseph Spaulding listed in Emden Tax Lists, 1810-1890 (5); Revolutionary War Pensioners, 1840 (6); and Fairfield Taxpayers, 1793. (7) You could spend days exploring the Maine Genealogy website. After you have exhausted all the Maine sites, you can, of course, search for your Maine ancestors on sites such as Familysearch.org, Ancestry.com, AmericanAncestors.org, Findagrave.com, Genealogybank.com, Fold3.com and many more. The amount of information out there is staggering. Dover Publications, Inc., Mineola, New York, Electronic Clip Art,Women Illustrations, 2004. 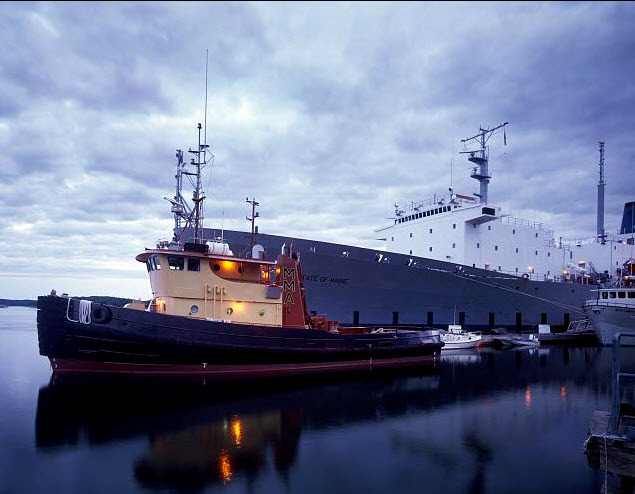 State of Maine ship, a teaching vessel for the Maine Maritime Academy, Castine, Maine, Digital ID: (digital file from original) highsm 16492 http://hdl.loc.gov/loc.pnp/highsm.16492 , Reproduction Number: LC-DIG-highsm-16492 (digital file from original) LC-HS503-6442 (color film transparency), Repository: Library of Congress Prints and Photographs Division Washington, D.C. 20540 USA (http://hdl.loc.gov/loc.pnp/pp.print: accessed January 27, 2013). (1) "Helen F. Spaulding, Class of 1864," Maine Memory Network, Maine Historical Society, copyright 2012-2013 (http://www.mainememory.net/sitebuilder/site/779/slideshow/422/display?use_mmn=1&prev_object_id=1188&prev_object=page: accessed January 27, 2013). (2) “Civil War Officers and Other Misc. Photographs” database, Maine State Archives, Department of Secretary of State, State of Maine, copyright 2005 (http://www.maine.gov/sos/arc/archives/military/civilwar/offpix.htm: accessed January 27, 2013). (5) “Embden Tax Lists, 1810-1890” database, Maine Genealogy (http://archives.mainegenealogy.net/2011/03/embden-tax-lists-1810-1890.html: accessed January 27, 2013), entry for Joseph Spaulding, citing Ernest George Walker, Embden town of yore: olden times and families there and in adjacent towns (Skowhegan, Me. : Independent-Reporter Co., 1929). (6) “Revolutionary War Pensions, 1840” database, Maine Genealogy (http://archives.mainegenealogy.net/2010/02/revolutionary-war-pensioners-1840.html: accessed January 27, 2013), entry for Joseph Spaulding, citing A census of pensioners for revolutionary or military services: with their names, ages, and places of residence, as returned by the marshals of the several judicial districts, under the act for taking the sixth census (Washington, D.C.: Blair and Rives, printers, 1841). (7) “Fairfield Taxpayers, 1793” database, Maine Genealogy (http://archives.mainegenealogy.net/2009/02/fairfield-taxpayers-1793.html: accessed January 27, 2013), entry for Joseph Spaulding, citing Harry Edward Mitchell, et al., comp., The Fairfield register, 1904 (Kent's Hill, Me., The H. E. Mitchell publishing company, 1904).